Bring the water and the rice to a boil in a medium-size saucepan. Reduce the heat to low, cover and cook at a simmer, 20 to 25 minutes (amount of liquid needed and cooking times may vary depending on the type of rice used). The rice will be done when the water has been absorbed and the grains are tender to the bite. Preheat the oven to 205°C and line a baking sheet with parchment paper. Trim both ends of each butternut and slice in half lengthwise. Scoop out and discard the seeds and the attached pulp. Brush both sides of each butternut with the olive oil, and season the inside to taste with salt and pepper. Roast the butternut, cut side up, until easily pierced with a fork, about 30 minutes, and remove from the oven. Lower the oven heat to 175°C. While the butternut roasts, make the filling: Transfer the rice to a large mixing bowl and add the ⅛ cup (30ml) of olive oil and the parsley, nuts, dried fruit, fennel seeds, ginger, citrus zest and chili pepper. Stir until the rice is coated with the oil and the ingredients are well mixed. Add the ¼ teaspoon salt and pepper, stir, taste and adjust the seasonings if necessary. Fill each butternut half with about ¼ cup (60g) of the filling. Return to the oven and heat for about 15 minutes, until the filling is warmed through. Serve immediately, or lower the oven temperature to 107°C, cover with foil, and hold until ready to serve. 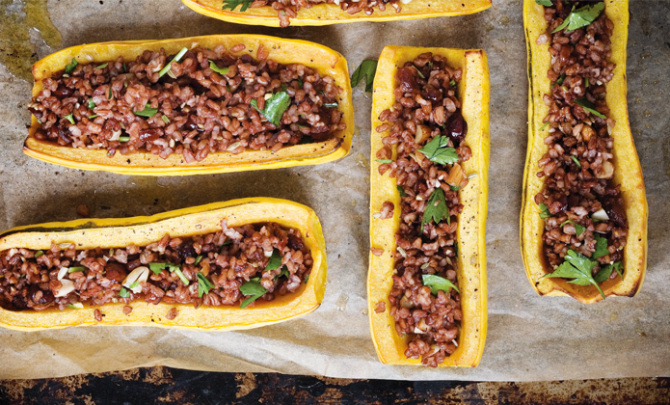 Notes: There's enough filling for eight servings (one squash half per person). For a party of six, you'll have more than a cup (225g) of extra filling, which you can bring to the table. Recipe courtesy of Kim O'Donnel, author of The Meat Lover's Meatless Celebrations.